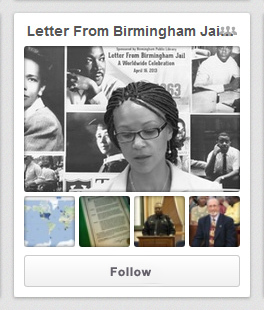 Thank you to everyone who took part in this celebration honoring Dr. Martin Luther King, Jr. Photographs and videos of locations participating in the worldwide event may be viewed on BPL's Pinterest board Letter From Birmingham Jail a Worldwide Celebration. Press and videos about the event may be viewed on the In The Press page. On April 16th, 2013, the 50th anniversary of the day that Martin Luther King, Jr. began writing his Letter from Birmingham Jail, participants worldwide will read King's Letter in celebration. Participants will host public readings from the Letter at various locations around the globe: libraries, museums, schools, universities, churches, synagogues, temples, work places, public parks, bookstores, street corners, coffee shops and anywhere people want to participate. Register your participation and join in the celebration. This event is sponsored by the Birmingham Public Library. "When the hour came we lived up to our promise." -Martin Luther King, Jr. The text of Letter From Birmingham Jail is available online and at your local public library. Below are a few locations. Facebook: Add your name to the event. Flickr: Letter From Birmingham Jail Celebration Group Share photos and videos of your event on Flickr.